In order to boost experimental research linked to future power grids, the SINTEF Energy Lab has today been granted funding of up to NOK 30 million from the Research Council of Norway as part of the National Financing Initiative for Research Infrastructure. 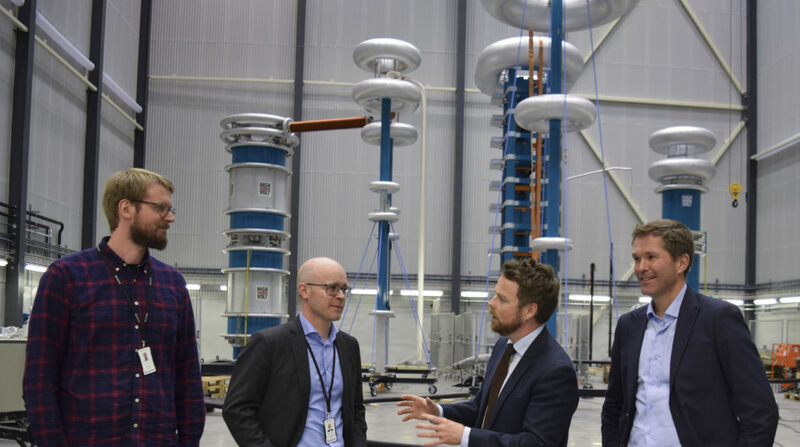 The funds will be used to develop a laboratory facility called ElPowerLab, which is part of the SINTEF Energy Lab, and which will contribute towards the development of future power components for use both in Norway and worldwide. Efficient and reliable electricity distribution grids are essential for the green transition, in which the introduction of new energy sources, combined with flexible distribution and use, will play key roles. new technologies for the generation, conversion and distribution of electrical power. The European electricity distribution grid runs on an ageing infrastructure and, as time goes on, some of its components will struggle to cope with increased loads and levels of utilisation. For this reason, it will become necessary to develop reliable and high-performance power components to meet future demands. 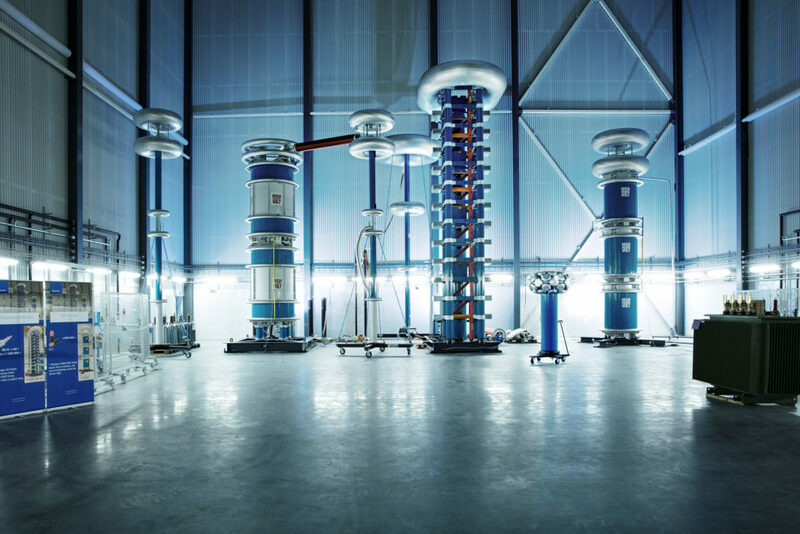 The SINTEF Energy Lab was opened in 2015, and is a modern laboratory facility designed to carry out the testing and development of, and research into, high-voltage power components and power electronics. This work is carried out in close collaboration with NTNU. The laboratories now offer greater capacity and higher levels of performance than previously, and are meeting the demands of the market. The ElPowerLab will be made available to Norwegian and global research communities and industries. The excellent combination of research into basic properties and industrial development make these facilities ideal for the development of future power components. The ElPowerLab will be used to develop and test relevant insulation systems and components under loads that are anticipated to occur in future power distribution grids. It will be possible to generate such loads both in small model contexts and in connection with full-scale components and experiments. Future power components will have to cope with more dynamic load patterns and higher power peaks. Moreover, the introduction of more power electronics to the grid creates other loads on insulation systems, and demands for more compact power plants and the use of environmentally-friendly materials may also result in new types of faults. 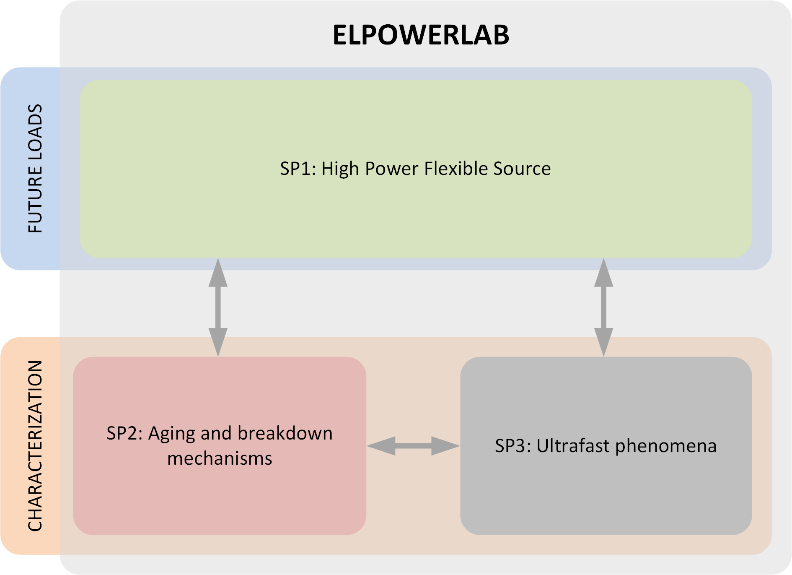 In order to investigate how new load patterns impact on failure modes and ageing mechanisms in materials and components, the ElPowerLab will incorporate high-power sources (SP1) that emulate future load patterns, as well as state-of-the-art analytical and characterisation equipment (SP2 and SP3), as illustrated in the figure below. The sources (SP1) will consist of both a flexible high-current source as a means of investigating thermal issues from dynamic loads, and a voltage source that emulates loads generated by both current and future power electronic devices (converters) that are increasingly being installed in the distribution grid. In order to understand breakdown and ageing mechanisms caused by new load patterns, an assembly of analytical equipment for thermal, mechanical and electrical characterisation will be installed. Breakdown mechanisms caused by electrical loads can be extremely rapid processes, and optical and electrical characterisation equipment will be integrated into the high voltage experiments in order to investigate such phenomena. Equipment specification, installation and testing will start in 2017. Operational start-ups and user access for the various components installed in the laboratory facilities will take place in the years leading up to 2020, by which time it is planned that the ElPowerlab will be completed.